In 1993 I was asked to create a site-specific sculpture installation for the Season Opening Gala at Jacob’s Pillow, a dance center in Becket, Massachusetts. I created an installation that echoed the movements of modern dance. 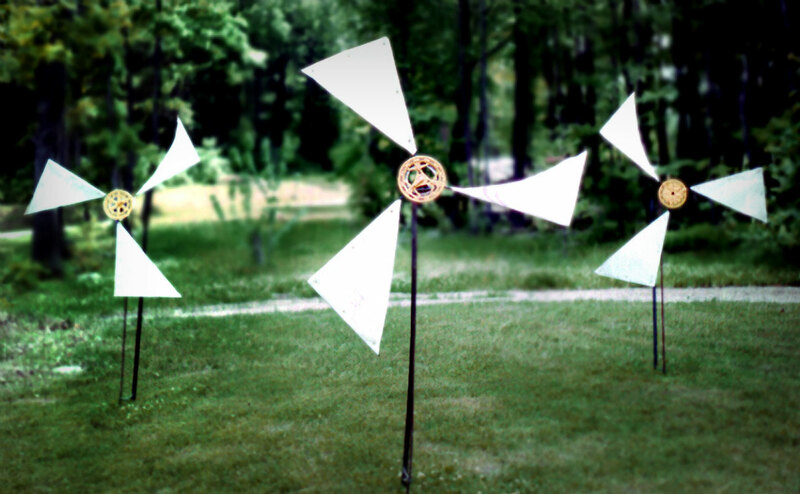 The three kinetic sculptures, made of canvas, steel, and bicycle parts donated to the Art Foundry’s scrap heap, lilted upon the Berkshire County breezes all afternoon. Completed and installed in 1993; welded steel, recycled bicycle parts, and canvas; private collection (not for sale). 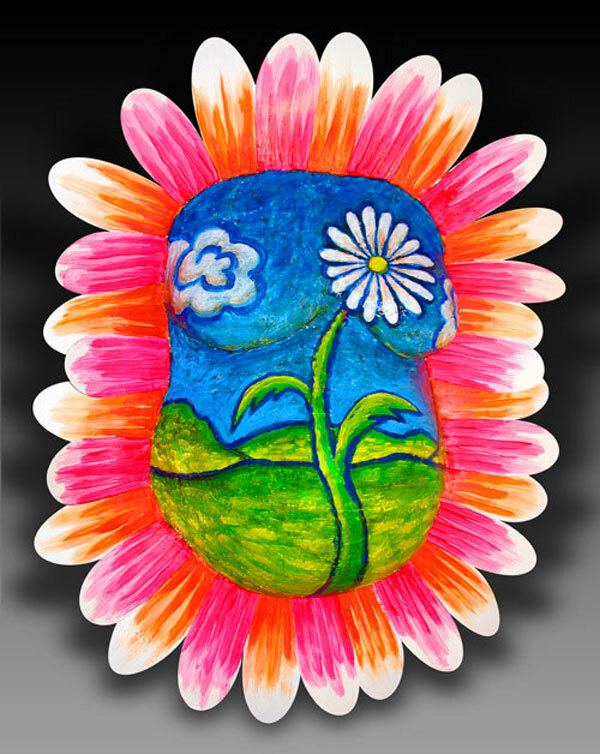 It is fun to work with juxtapositions where the nature of the medium contrasts with the object it represents. 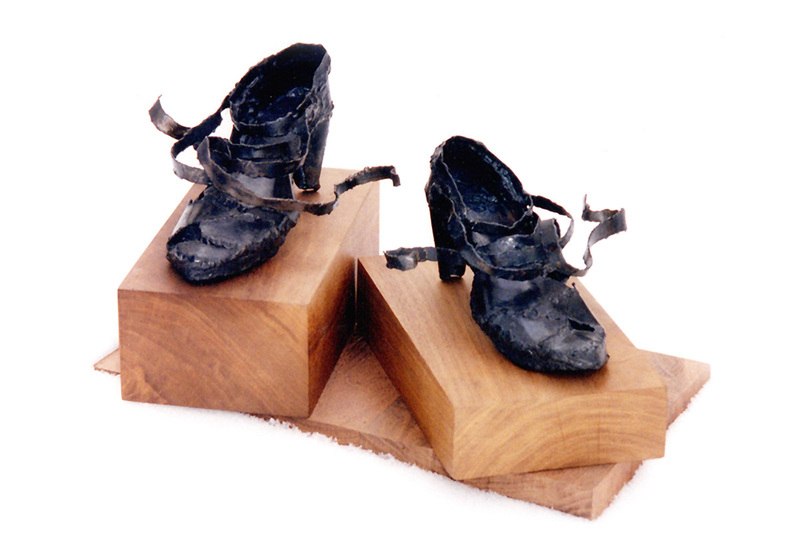 In the case of Muse Shoes, I forged a pair of soft, delicate shoes out of hard, cold steel, and displayed them on a walnut base. The process I used to make these is called oxyacetylene welding. Two gases, oxygen and acetylene, are combined under regulated pressures and are ignited at the tip of the welding torch. The welder heats the intersection of the metals to be joined. As the metals begin to melt, the flame is swirled in order to moderate the heat and control the melting. More steel is fed to the cherry-red pool via a thin rod held in the other hand. In many cases, arc welding (which uses electricity) is more efficient for basic joining operations. 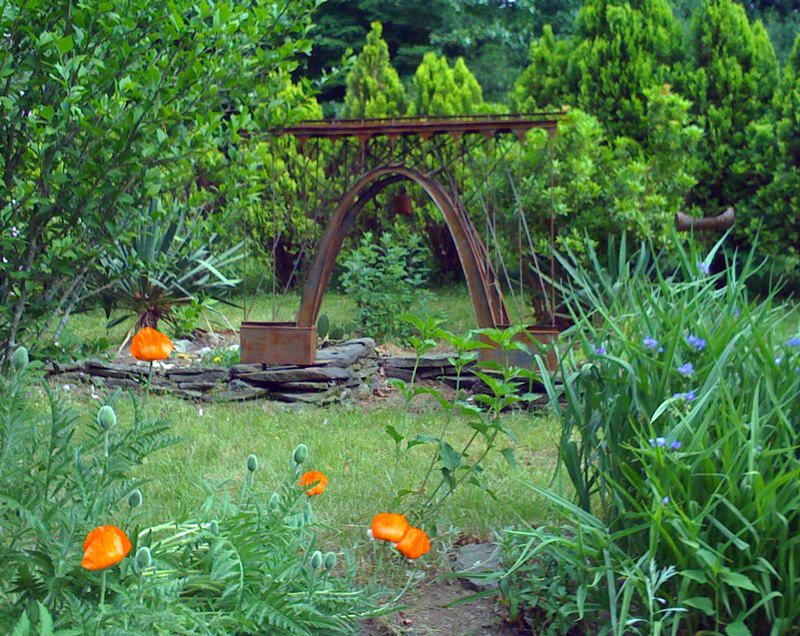 But flame-based welding lends itself to organic techniques such as bending, hammering, distressing, and applying patinas. Therefore oxyacetylene welding is attractive to the sculptor. Private collection (not for sale). I was born in the Year of the Horse, and I view the horse as a sort of personal totem or power animal. 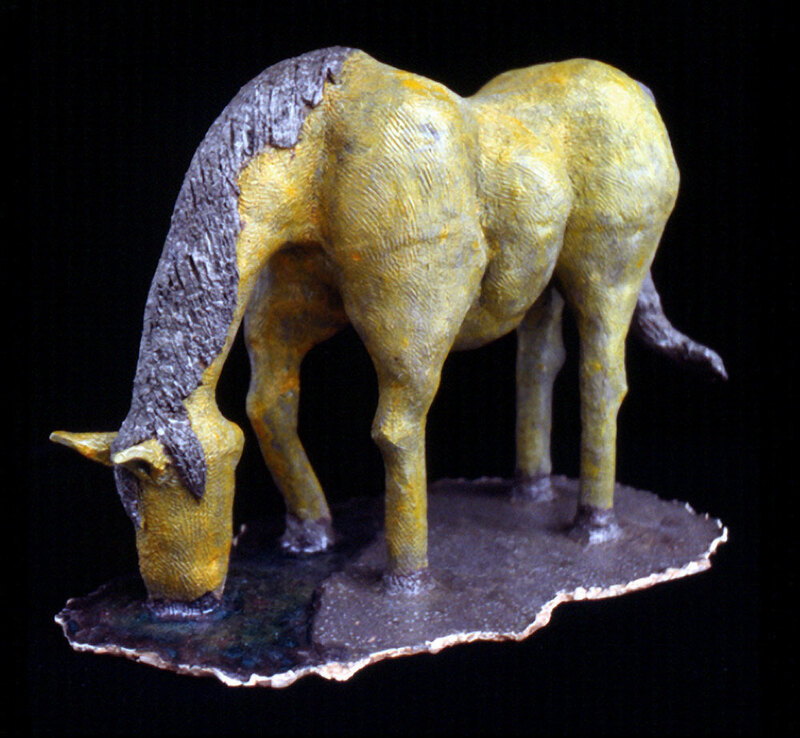 While I was a student at the University of Massachusetts, I sculpted this piece out of low-fire red clay, fired it, glazed it, and fired it again. It’s about the size of a basketball. Private collection (not for sale). A sculptural installation involving welded steel boats carrying symbolic cargoes, and a welded steel arch bridge. 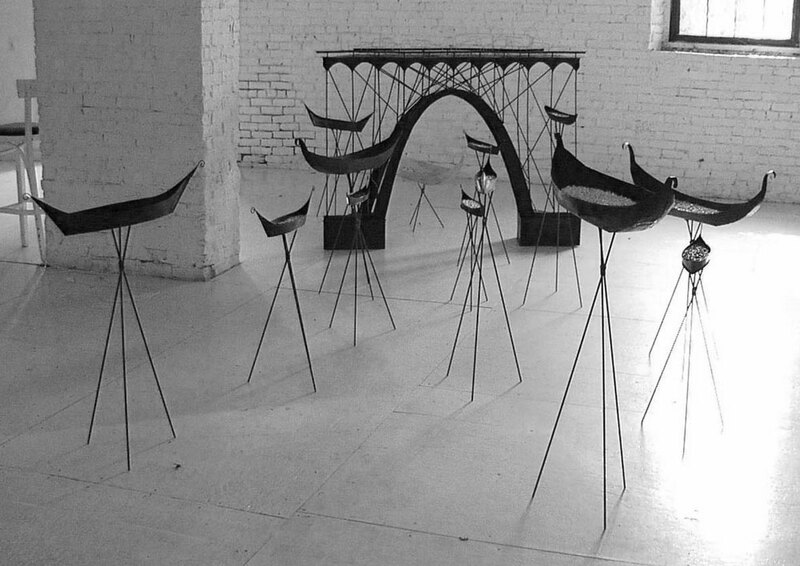 Around the end of the 20th Century, I hatched an idea to build a sculptural installation involving 33 metal boats, each filled with a symbolic cargo and arranged so as to converge on a passage through a steel arch bridge. The idea was somewhat informed by numerology, coincidence, our collective anticipation of the new millennium, and a vague interest in the mystique and lore surrounding Freemasonry. I was nearing my 33rd birthday, 33 happened to be my favorite number at the time, and 33 is the highest degree in the Scottish Rite. But the larger metaphor was simply one of passage. The opening in the bridge represented a rite of passage from one part of life to another, or from life to death and whatever lay beyond. It also represented an intersection between the realities of what was going on in the water under the bridge, vs. the realities that were being connected by the platform of the bridge. I first showed the installation at the Berkshire Artisans Gallery in Pittsfield, Massachusetts in 1999, under the title of Midnight Freight. Freight in this sense represented the “baggage” that we all carry with us from our childhood throughout our lives. And the midnight aspect hinted at the subconscious, sub-rosa nature of these things. The materials that filled the boats were things that I associated in some way with my childhood: sweetgum pods, old pennies, acorns, bony-fingered twigs from a cottonwood tree, half-burned candles, red Georgia clay, etc. Later, I showed the installation again with significantly fewer boats, different cargo, and configured to speak to a different theme. Living With the River was a juried show that took place at the Canal Gallery in Holyoke, Massachusetts in 2001. Artists were asked to weigh in on the influence they felt by living in the vicinity of the mighty Connecticut River that cuts through our fertile Pioneer Valley. Three Sisters is an expression symbolizing the corn, beans, and squash that are staples of various Native American groups, many of whom lived in this region in abundance before the appearance of European Settlers. In this installation, the boats carried dried corn kernels, dried beans, and squash seeds. In this way, my piece spoke to the inescapable history that we shoulder in the course of our modern-day life with the river. Namely, that we must recognize and honor the other cultures that preceded us and—in their own ways—lived with the river. While the diaspora of boats has mostly made its way out into the private collections of the world, the bridge itself remains in my private collection. The bridge is composed of brazed steel (meaning that brass—which has a lower melting point than steel—is used as the joining metal). It has rusted to a nice patina. 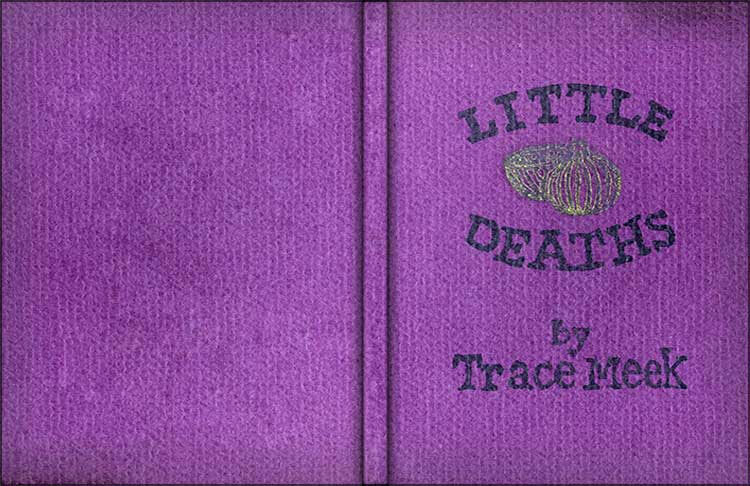 In 1995, fresh out of college, I wrote and published a chapbook called Little Deaths. I approached this project as both a writing exercise and as serial sculpture: After I wrote the story and the haiku poems, I hand lettered, illustrated, printed, assembled, and bound all fifty copies in the edition (plus a few artist’s proofs). I did not have a computer at the time, so there was never a digital master. This production was as analog as it could be. The entire series was handmade using photocopies, blueprints, hand-carved rubber stamps, ink, and glue. For the front cover (shown above), I used a highly-textured purple paper, which I glued to three chipboard supports (front and back covers; spine). I printed the title, by-line, and “logo” with rubber stamps that I carved by hand from rubber erasers. I developed this pattern of onions by stamping repeatedly with the aforementioned rubber stamp. Can you tell that I like onions? The left page was semi-translucent vellum, hinting at an onion skin; the right was an actual blueprint, which provides a nice velvety texture and some wonderful, accidental color bleed. Another blueprint featuring an enlargement of the onion pattern. The story begins with a walk. a subtle ridge to a cornfield and an apple orchard, to a view of those familiar mountains in the distance. The weather was unseasonably warm, but a roaring wind blew thick, moist air in over the mountains. High above, the close-knit trees clacked their leafless branches together as though they were deer locking antlers. then they both come back. and new ones are formed. I sold a few copies of this chapbook on consignment through a cool but now defunct bookstore (whose name I forget) in Downtown Amherst, gave many copies away to friends, family, and muses, and kept none for myself. Thanks to an old friend, a copy made its way back to me nearly two decades after I published it, so that I could scan it and reproduce it here. Enjoy.